Baseball fencing is used to cover the top edges of chain link fence where the fence is rough, sharp, and potentially hazardous. The fence topper, as it is called, simply does what its name dictates. Many outdoor sporting facilities now use chain link fence around the perimeter of the field or at parks. 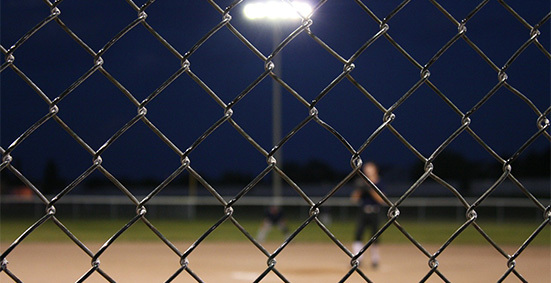 Knowing this, it is prime time to invest in keeping your active child safe by purchasing baseball fencing to go over the top edges of your parks, schools, or local baseball or softball fields. It not only is suited well for fencing at baseball fields, but athletics tracks, football stadiums, school perimeters and a multitude of other situations as well. Baseball fencing comes in numerous colors and styles all designed to inconspicuously provide protection for both spectators and athletes while providing an aesthetic feel and look. It is made of polypropylene and #2HDPE completely recyclable corrugated plastic to maintain a natural feeling to your natural environment. Get a free quote by calling (800) 878-7829 or email sales@baseballfencetopper.com today!